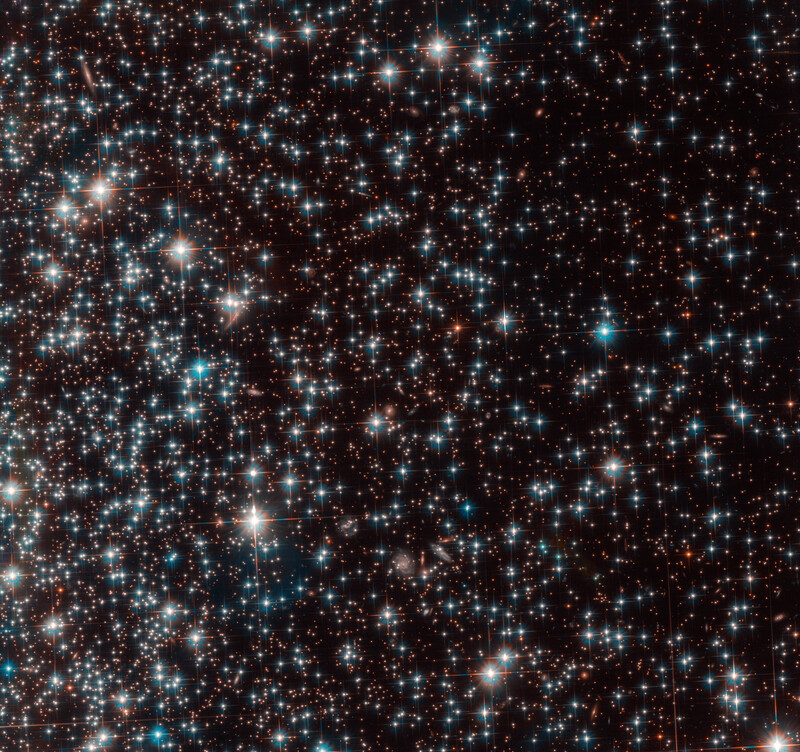 Can you find the dwarf galaxy lurking behind the foreground stars of a much closer globular cluster? Hint: It’s near the upper left corner. Click to zoom in. Image: ESA/Hubble, NASA, Bedin et al. 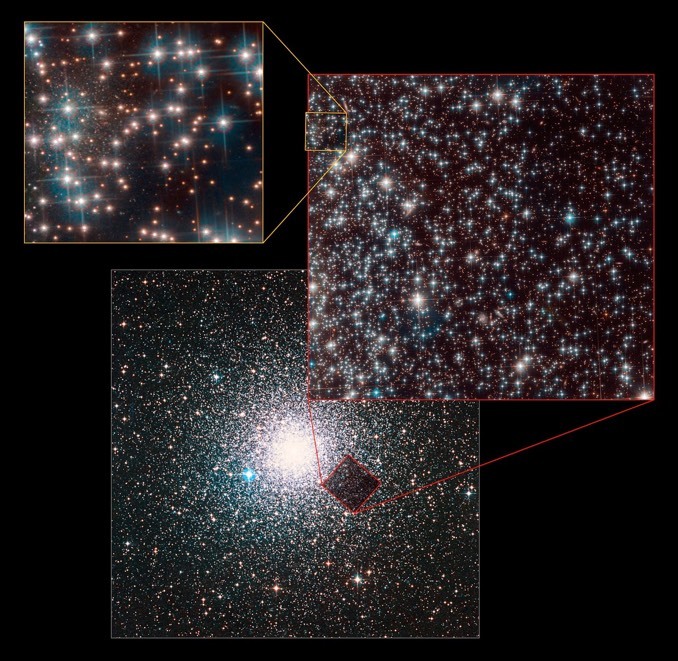 Researchers using the Hubble Space Telescope to look for white dwarf stars in globular cluster NGC 6752, a project to determine the cluster’s age, stumbled across a previously unknown, relatively close dwarf spheroid galaxy lurking behind the much closer stars. Nicknamed Bedin 1, the galaxy is some 30 million light years from the globular cluster, which is located in the Milky Way’s halo. Bedin 1 measures just 3,000 light years across at its widest, a small fraction of the Milky Way’s size. Dwarf spheroid galaxies are known for their small size, low overall brightness and ancient stellar populations. The Local Group of galaxies, which includes the Milky Way and Andromeda, features at least three dozen such dwarf spheroids. 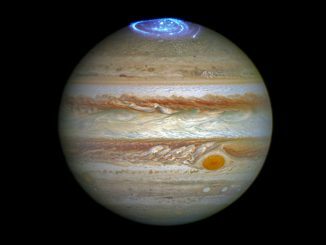 Based on detailed analysis, an international team of astronomers led by L.R. Bedin of the INAF-Osservatorio Astronomico di Padova, Italy, concluded Bedin 1 is made up of stars born within about a billion years of the Big Bang. It is extremely isolated and relatively unaffected by interactions with neighbouring galaxies, making it an astronomical fossil of sorts. The discovery was serendipitous, especially given the galaxy’s small size and low luminosity. 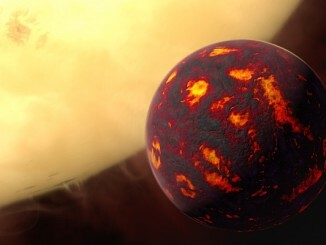 More such dwarf spheroids may be found in the future by space telescopes able to image larger areas of the sky. 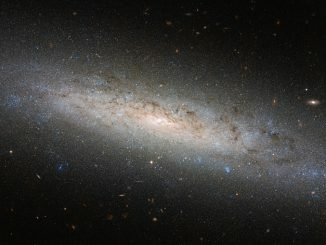 This glorious spiral galaxy is known as NGC 24, measures some 40,000 light-years across and lies about 25 million light-years away in the southern constellation of Sculptor. However, there may be more to this picture than first meets the eye: 80 percent of NGC 24’s mass is thought to be held within an invisible dark matter halo.